The memorial to Albert Einstein, situated in an elm and holly grove in the southwest corner of the Academy grounds, was unveiled at the Academy's annual meeting, April 22, 1979, in honor of the centennial of the great scientist's birth. 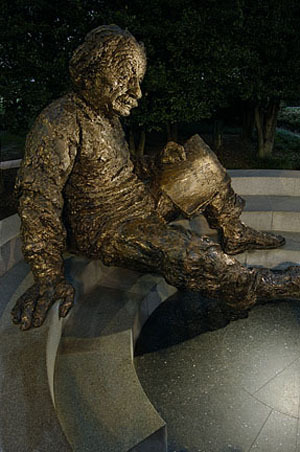 Einstein is depicted seated on a three-step bench of Mount Airy (North Carolina) white granite. The bronze figure, weighing approximately 4 tons, is 21 feet in height. Three caissons, totaling 135 tons, sunk in bedrock to a depth of 23 to 25 feet, support the monument. The star map at the statue's base—a 28-foot field of emerald pearl granite from Larvik, Norway, is embedded with more than 2,700 metal studs representing the planets, sun, moon, stars, and other celestial objects accurately positioned by astronomers from the U.S. Naval Observatory as they were on the dedication date. The sculptor, Robert Berks, known for his portrait busts (John F. Kennedy at Washington's Kennedy Center), based the work on a bust of Einstein he sculpted from life in 1953. Landscape architect James A. Van Sweden designed the monument landscaping. Einstein was elected a foreign associate of the Academy in 1922 and became a member in 1942, two years after he became a naturalized citizen.